Simple, fast and user-friendly, AppIschia is a practical and functional guide to the island of Ischia! It is kept constantly up-to-date and has been optimized for Smartphones and Tablets, making it an extremely useful tool for tourists and local residents alike. Everything you need to know is just a click away: Information on the Local Area and Places to Visit; Real-Time Hydrofoil/Ferry Operating Times; Where to Sleep, Eat, Drink, Go Shopping and Have Fun; Events on Ischia; Late Opening Pharmacies; Car, Scooter and Boat Hire…and much, much more. The straight-forward, accessible graphics permit rapid consultation of all the sections of AppIschia, where you will find detailed descriptions and specific information: telephone numbers, addresses, photos, websites, emails and maps to identify the exact location of the various places. And as if that were not enough, thanks to the gps function offered by all smartphones and tablets, AppIschia can even direct you to your chosen destination. 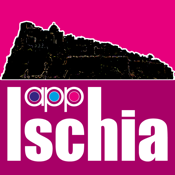 AppIschia: a whole island in an app!! !